Eat cabbage against obesity and atherosclerosis and good digestion. Cabbage is a vegetable that is stored easily and are therefore present in the market all year round. He has excellent taste and nutritional value. There are different varieties of cabbage: green, red, Chinese, savoy. Cabbage is rich in vitamin C, which is the highest values in yogurt. Rich is more vitamin P, B1, B2, B3, B6, B9, PP, H, K and others. It contains amino acids, sugars, nitrogen compounds, dyes, and mineral salts. There is a high percentage of water, from 2.6 to 8% sugar, depending on the variety. The salts therein are potassium, calcium, phosphorus, sodium, chloride, magnesium, sulfur, iron, and the like. Cellulose improves motility of the bowel and has a beneficial impact on the development of beneficial intestinal bacteria. It found therein lipids give it specific taste and smell. Due to its low calorie (25 calories per cup chopped green) and high content of salts and minerals it is very suitable for diets and overweight, obesity and atherosclerosis. Salts of potassium prevent water retention in the body. Particularly useful is tartronic acid, which prevents the conversion of carbohydrates to fat. In folk medicine, cabbage is recommended for diseases of the gastrointestinal tract, diseases of the spleen, liver, gout, vitamin deficiency, diabetes, colitis. 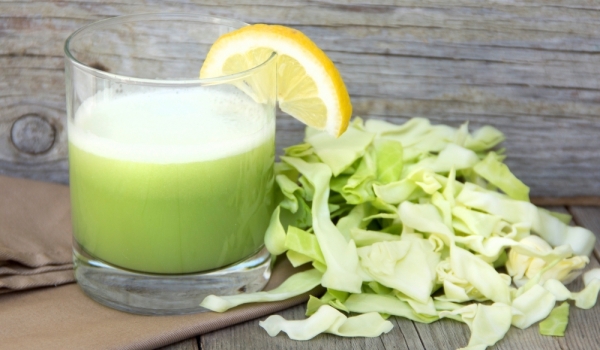 Freshly squeezed cabbage juice has a laxative effect. Cabbage leaves superimposed on the forehead act invigorating and refreshing headaches. The market is already meeting and another kind of cabbage – Bok Choi. It has dark green leaves with long, firm and white ribs. More like lettuce and beets, but the taste is typical cabbage. Bok Choi is rich in calcium and vitamins cabbage and finds increasing use in healthy eating. – The pungent smell of cabbage softens, adding to the dish add a couple of sprigs of parsley.